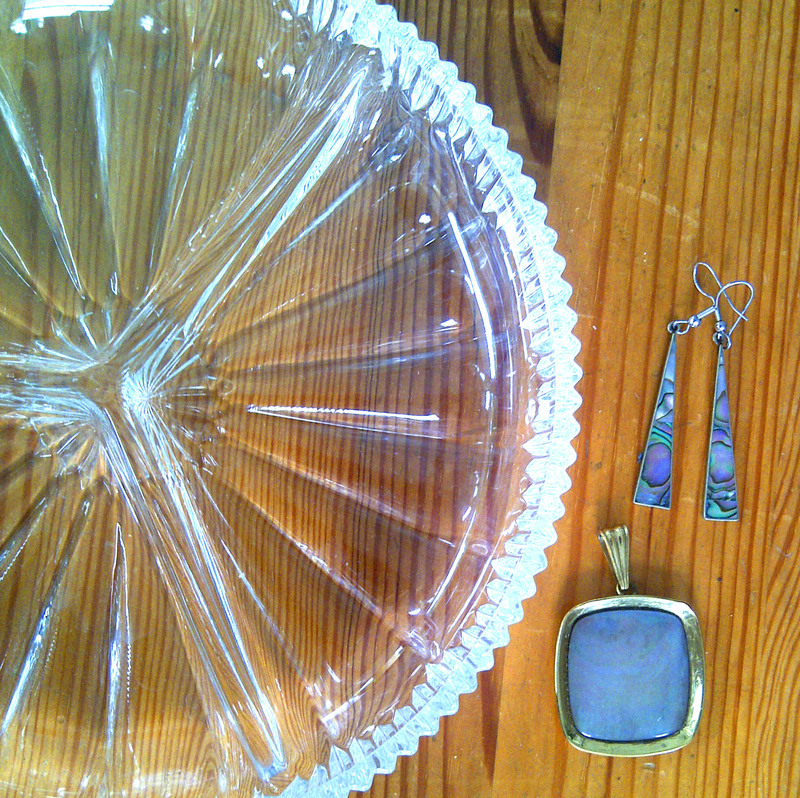 Treasure and Cake. It doesn’t get much better than these two things, especially together on the same day. Saturday was glorious here in Bielefeld. For those of us used to the perpetual rain clouds over our heads, or what I affectionately call “our Charlie Brown Town”, it was a weekend not to be misused by staying inside. So Saturday we rolled ourselves out of bed and decided to hit the double flea market day. 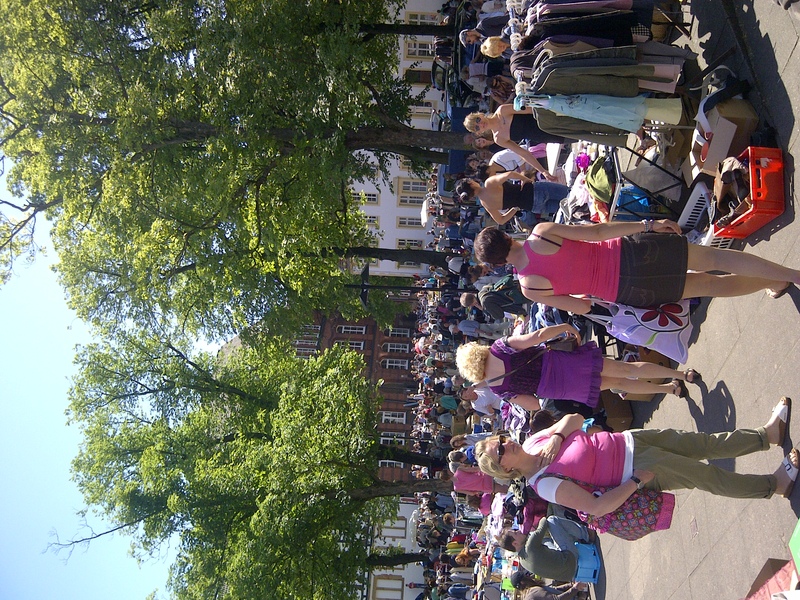 My two favorite flea markets in Bielefeld are the Klosterplatz Flohmarkt and the Siegfriedplatz Flohmarkt. Normally they fall on different days of the month, but because of holidays and the City Fair, this year they both fell on the same day. How will I choose which to go to? Will I miss the treasures of one if I go to the other? No worries here, because one is in the morning until about 1pm and the other does not start until 3pm! Oh Joy! So our first stop was the morning maven’s treasure chest at Klosterplatz. It is located in the plaza behind the Catholic church (Süsterkirche) right in the heart of the Altstadt and usually falls on the third Saturday of the month. It starts at some ungodly hour in the morning, I think 6am. I can’t be sure because I’ve never ventured out so early on a Saturday. In any case, I normally get there around 9:30am and I promise you there are still fantastic things to be found. Furniture, bikes, clothes, shoes, always great lamps or some funky artwork. A few years back I found an awesome old fashioned shaving kit and straight razor. The sweet lady had said it belonged to her husband, but had been in a drawer for over 40 years! By the looks of the design on the boxes, I am betting longer! I love old boxes with design from yesteryear. All for just 2 euros! And this past year I found a new love in Agnes my sweet little pinhole camera. The lady even had flash cubes and film for it! All for 6 euros. She thought I was crazy and maybe I am 🙂 Really. I found an old tea set and the lady practically threw it at me! I think I ended up giving her 4 euros just because I couldn’t take a 24 piece set for free. Of course I still haven’t figured out where to put it in my kitchen. However, today was not to be for me at my lucky Klosterplatz. I got there a little late and the fine weather was making the vendors want to close shop early and go somewhere fun. No problem, I have another market in a few hours to hit and right now we could use a break in the shade and order a latte! Stop #2 was our afternoon favorite that starts at 3pm (2:30 is when everyone can set up and thus business starts as soon as the sellers are putting things out) on the last Saturday of the month. My advice for this particular market is to get there at 2:30. The official start time is at 3pm, but by then 100s of transactions have already taken place, and good things have been snatched up. If you are just looking for clothes, they will be there all afternoon, but the interesting finds (like dressmakers dolls, mannequin arms, top hats that fold, sputnik stools and glass beads) disappear quickly. Vendors are given the option of paying for their stall with home-baked goods that are then sold for the community center (our fair Bürgerwache). So that gives you two reasons to go. Oh and of course there is also the Supertram selling beer in the shade. So when you need break from your hunting, or if your dearest needs a place to wait for you, Supertram has you covered. The thing I love about both of these flea markets is that they are neighborhood markets and have very few if any “profi-vendors”. Most of the time, the tables are full of one man’s trash with the potential to be one man’s treasure. 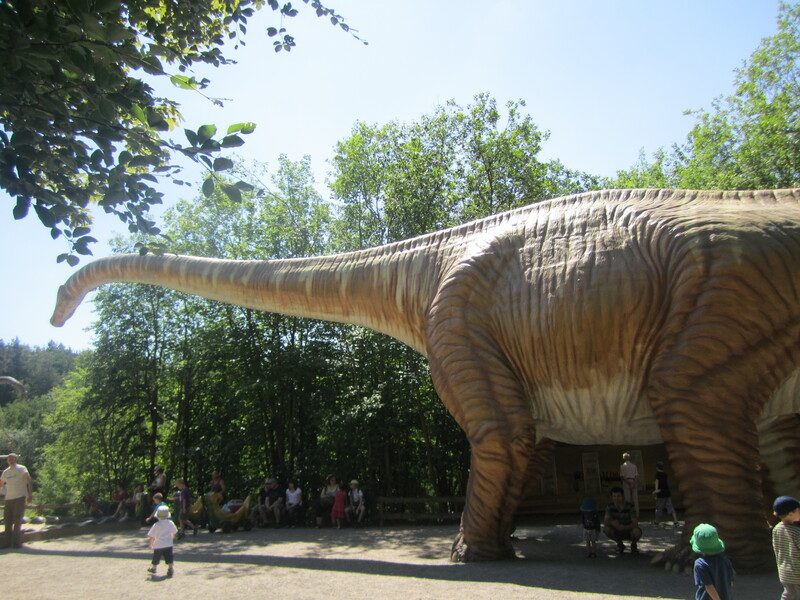 We went to the Dinosaurier Park near Hannover this weekend. 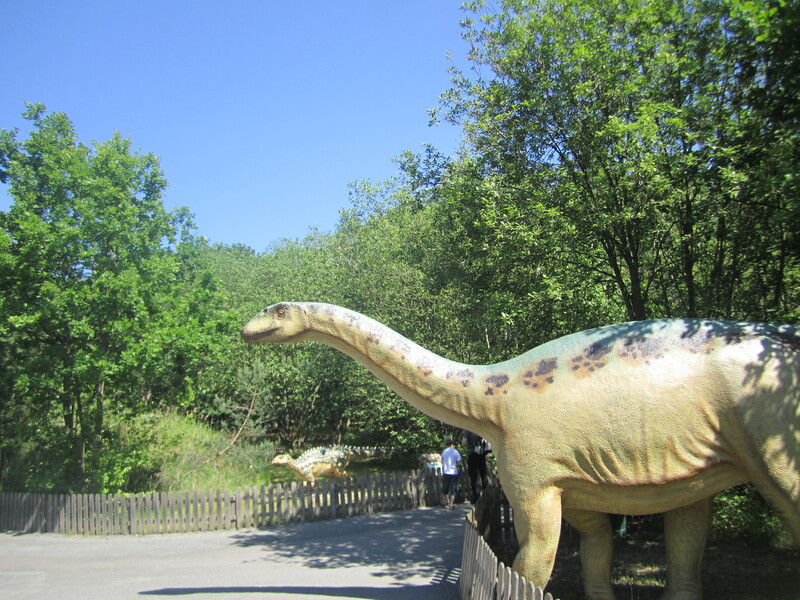 It’s a fun place if you have youngsters interested in dinosaurs. Visitors walk around admiring life sized models in the woods. Some are huge and there are plenty to see, a few can be climbed on. There are a couple of nice playgrounds and several picnic areas. There were also extra activities for additional charge (panning for gold, cracking open fossils etc). Overall my son and husband enjoyed it but I felt it was rather overpriced. So more of a place to visit as a one off. To our amusement, we also saw signs to a stork museum and a herring fishing museum on the way. My son loved his toddler gym class at the Hedwig Dornbusch Schule. They have a great selection of kids classes from art, movement to music. They are very affordable so places fill up fast. They also have a good selection of adult classes too. 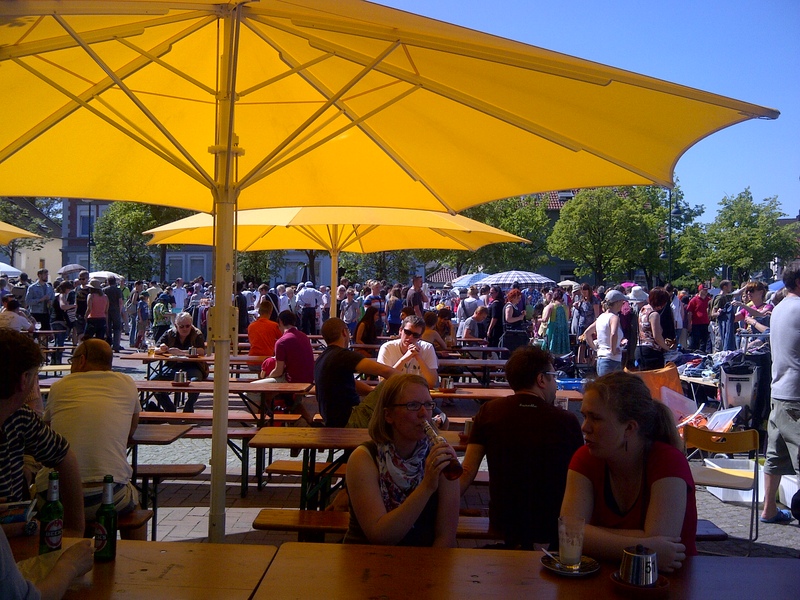 I visit the big square at Siegfriedplatz often as it’s a central part of my neighbourhood. There is a big open air market on Wednesday and Friday mornings selling all sorts of veggies, fruit, cheese, meats, breads, flowers etc. I have also been told the fish and chips stall is great for a quick snack. 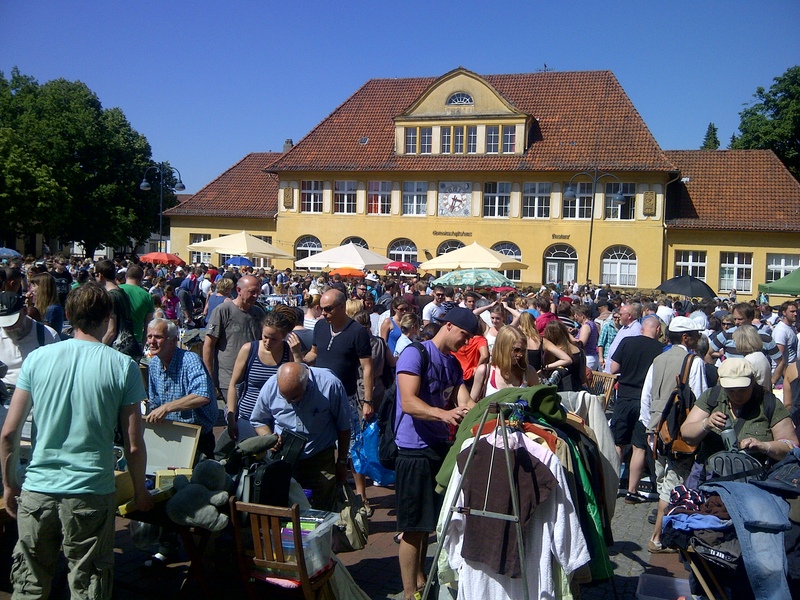 On the last Saturday of each month from March – October there is a second hand market in the afternoon. There are also other special markets that visit for example a great fabric / cloth market in the spring. Lectures, films and discussions happen in the big yellow building and rooms are available to rent for group meetings at very cheap rates. http://www.facebook.com/l/BAQGH1nvSAQE5o6lOjS8uiKWmzAs3vYwZVLuubOGACTdCyQ/www.lz-veranstaltungen.de/ Just put in *Rubrik* :Flohmarkt and in PLZ/Stadt: Bielefeld Or look on the notice boards at local supermarkets.